Diva Devotee: [Review] Listen To Mariah Carey And Miguel Make "#Beautiful" Music Together...Sorry, I Couldn't Resist...I'm Lame. 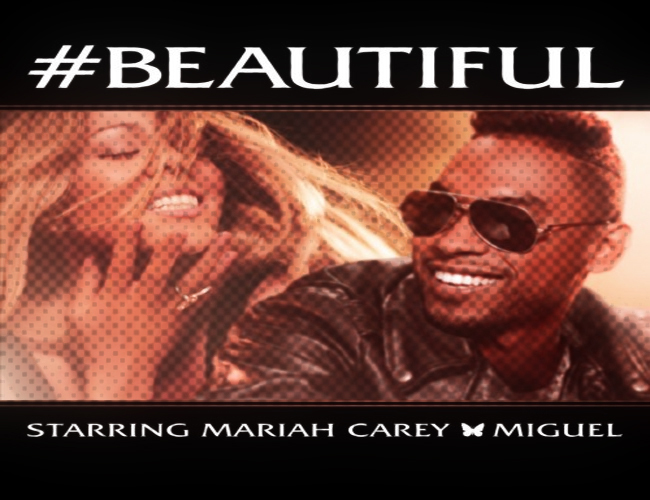 [Review] Listen To Mariah Carey And Miguel Make "#Beautiful" Music Together...Sorry, I Couldn't Resist...I'm Lame. Thank God for #Beautiful! I was starting to lose faith in Mariah Carey after Triumphant (Get Em) and Almost Home failed to illicit much, if any, of the love I usually feel for an MC release. For some of you who are not so hot on her, not liking two songs might not be a big deal. But for someone like me, who can listen to her back catalogue pretty much straight through, it was more than a little disconcerting to have two strikeouts (in a row, no less) after more than a decade of consistent home runs! It was pushing me to thinking I'd fallen off the Mariah bandwagon completely, but #Beautiful has given me faith a new in Mariah! Phew! As good as #Beautiful is, it's not perfect. But let's start with the positives. It's great to hear Mariah tackle a new sound, and though still Rnb, like most of her hits, it definitely has a more indie infusion than the Pop or Hip-hop she usually dilutes the genre with. Excitingly, it gives the singer a freshness that she hasn't enjoyed in a long while, making her sound relevant and current. Hopefully it'll help the Diva generate the buzz needed for a hit by appealing to- and surprising- critics and non-fans alike. Of course Mariah's voice, though more nasal, sounds stunning. Adopting an earthier/rawer timbre, the singer refrains from excess ornamentation for much of the song, adhering to a concise melody that is sensitive to the retro feel and Miguel's vocal style. Sure, she does let loose towards the end of the song, but it's totally called for, and she still manages to sound restrained (by Mariah standards) and sympathetic to the laid back air of the track- this is despite some gloriously quick melisma. Ultimately, it's a slight change in style for Mariah, but it should appeal to the current music listener who - if the success of Adele, Taylor Swift and P!nk is anything to go by- seems to have grown tired of showy vocals. However, like Triumphant, there is too little Mariah on the song- I mean, she doesn't even sing the first verse! It's also too short, feeling like by the time the Diva does join in, it's already fading out to its end. This was either a really smart move to make us crave more Mariah, thereby building excitement for a follow-up, or they just plain forgot to add the bridge that the song is clearly crying out for! Whatever the case, it's not long enough and I needed MOAR Mariah!! As it stands, yes the song sure is #Beautiful, it's just not #Perfect.But I'll settle for that right now. My heart's melting away. I luv this song. This is the most current I've heard Mariah sound in a while. Very breezy, summery vibe; I think it could do well on the charts. In terms of vocals, I love this timbre and texture to Mariah's voice the most because it's just so effortless, relaxed, and subdued. Definitely the best she's sounded in a while IMO. All in all, a very good comeback single. Welcome back Mariah! I absolutely love this song!! It really is a nice surprise, the teaser left us with no idea as to what to really expect too! Lovin' it! yes i do believe it's not the best from her but it's a start from her in this new era. The composition is different from her usual so maybe Mariah realize to refresh things. and she sure sounded fresh. As i expect from her she knows how to reinvent her music and herself through time so I'm giving her props but i just wish that she did some background while Miguel was singing at the first verse. I actually really prefer this over some of her chart smashers...call me a heretic if you will but if this is the new sound mariah is going for then Im all in! I Love the atmosphere and acoustic nature of the song. Her songs lately- as Brian described in Facebook- "I don't see why Mariah is letting people out-sing her on her own songs lately. I mean she sounds great! but like- she lets the other person out-stage her on the songs shes been releasing since the one with Justin Bieber." I do really like the song, apparently it has grown on me. But I can't help hoping that she'd release a solo of her own. I was a bit surprised for her direction of this new material, but I ain't complaining. Pretty fine to me. Probably a B/B+ for me. I wish the song was longer and had more Mariah. But I like it for what it is! The guitar riff is nice, and those Mimi vocals had me drooling. I really like this. It has a great summer vibe. I think it works as a duet and both Mariah and Miguel sound great. Seems to me this definitely should not just appeal to fans of both singers but just anybody liking a good tune on the radio. Good Lord, I used to love Mariah but she completely lost me with that Flops of a Hideous Demon album... Is this song enough for me to love her again? I don't think so... but if it gets support from radio it could be moderate success. Good luck Mariah! Lol I have always been a bit partial to Mariah though. And this Miguelsounds nice and that's a plus. I feel there is a definite shortage of good male vocalists today. In pop music that is. Not only that but the instrumentation was amazing. I enjoyed this thoroughly and the retro vibe it had was spectacular. Since I don't like either of them, it is hard for me to say, but this is...stellar... I hate swallowing my pride. This song is doing well! #8 on iTunes already! It would be much appreciated if you did a vocal range video! There is a vocal range video for him, but it needs to be updated. Miguel is definitely a breath of fresh air for pop/R&B music. His sophomore album was great, and he has managed to elevate his sound above today's typical pop/R&B sound. I personally hate Miguel so can you point me to some of his work. Email me his song list at black.robin100@yahoo.com. I just might actually check that album out. Only know him from te Grammy show and this song. :O why do you hate Miguel? is it his tone? and okay, I'll email his song list right now. Some lambs only think about #1's. A fan of old Mariah? I hate him too! Lol, he's tolerable on this song though haha. I see the facial similarites but we have two different cheek bone structures. I have softer facial features. We have the same shaped eyes and all but that is the only thing. My eyes are quite larger btw. lol And our hair, two worlds apart. I have thick, curly, dry hair. He has thinner, straighter (still curly but not my grade), and oily hair. I just hate my friends for that mess. I don't know if it will suit your taste, but I think it's worth a listen. And the thing about it, I don't find miquel attractive so what does that say about myself? Lol damn psychology. I genuinely don't think I could love this more. It's so easyyyyyyy. It's just pleasant on the ear. And those vocal runs around 2:46 and 2:52 are so swift. Her tone is glorious again, her sound is full and uhguhgughughughg. I also love her because she actually writes and composes and produces her songs. I'm ready for this Mariah era. Couldn't agree more... People keep saying "QUEEN Mariah is about to take her rightful place and oust KING Beatles" etc. I LOVE Mariah but having more Billboard #1 hits doesn't mean anything - it's a formidable achievement, but it doesn't allow any comparison between artists. It's musically meaningless. We all know getting to #1 says precious little about a song other than just that...number sold.There is absolutely no comparison between the Beatles and Mariah Carey. And even if there was, times have changed so much, there's nothing to compare. I hope it is. It's just a nice song of the summer. I can imagine sitting on the beach, Corona or pina colada or mojito (or sangria or gin and tonic or maybe I should go seek help) in hand and blasting this. It's a shame Australia is going into winter now... Though it's probably still warmer than most people's summers haha. After a second listen I'm sold! I definitely like it a lot better than Triumflop and "Almost Home". Really? LUV U even more. It was a little bland for me at first, but it got much better after the second listen. It's a nice cool summer jam. But I'm a little wary that even after Triumphant, she seems to still be taking a backseat to her featured artist, although I understand this song does work better as a duet. It sounds like for now she's going for a Memoirs vibe with more acoustic instruments. hahaha much more fitting tittle.